Can medicinal plants alleviate poverty and protect Nepal’s fragile environment? Farmers in the high Himalayas partner with a U.S.–based nonprofit to cultivate medicinal plants — and the environmental and economic benefits they offer. “It was a very clear indication that in the wild, these plants were being depleted and there was much overharvesting,” explains Meeta S. Pradhan, director of the institute’s Himalaya Program. The need for conservation became apparent and an idea was born: If the Mountain Institute staff could collaborate with local people to develop ways to cultivate these plants, they might not only spare the native forest from overharvest but also boost supply and provide a valuable source of income for the community. Today, some 16,000 highland farmers in six districts are cultivating 12 species of plants on more than 2,000 hectares with the Mountain Institute’s help.Mountain Institute staff members started with two or three different species, working with native people to grow them on private and degraded land in the mountains of Nepal. They found that some plants, such as the chiraito (also known as chiretta), a medicinal herb that contains a bitter-tasting chemical that is used to treat over two dozen diseases, disorders and ailments, could become ready to be harvested and sold in as little as two to three years. Encouraged, they worked with local community-based organizations to teach farmers to grow the plants. The farmers then set up small nurseries, transplanting plants from small greenhouses the Mountain Institute had set up in their own fields. 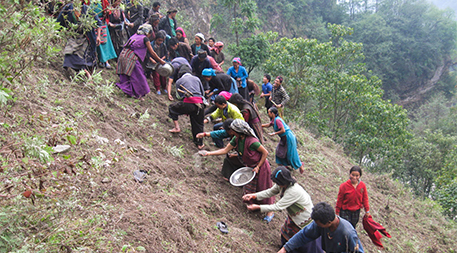 With the help of advisors from the Mountain Institute, Nepalese residents learn cultivation skills needed to move their medicinal plant enterprises from foraging to farming — an environmental and economic win-win. Photo by Karma Bhutia, The Mountain Institute. Today, some 16,000 highland farmers in six districts are cultivating 12 species of plants on more than 2,000 hectares with the Mountain Institute’s help — 10 percent of the Nepali production of medicinal plants, according to the Mountain Institute’s estimates. Anecdotal evidence suggests that farmers are moving out of poverty and into the middle class as a direct result of cultivating these medicinal plants, Pradhan says. 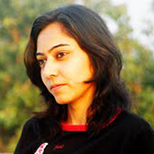 “In our last annual report, we talk about how farmers are now putting their kids in private schools,” she says. “They’ve been able to change the roofs of their homes, and they’re spending a bit more money on food and clothing. Because otherwise these farmers are mostly dependent on subsistence farming, they don’t have hard cash coming into their hands.” But the medicinal plants are helping with that, she explains, starting with as little as $300 a year for some farmers and going up to, in a couple of cases, $35,000. All told, in 2013, the families the institute works with earned a combined income of more than $800,000. By cultivating these medicinal plants, the farmers can help prevent erosion.Though she doesn’t have concrete data, Pradhan suspects that in addition to reducing overharvest of wild plants, the cultivated medicinal plants boost soil nutrition and water retention on the barren land farmers cultivate. This is crucial, because in terrain like the Himalayan highlands, deforested land is susceptible to floods when it rains and droughts during the dry season, causing damage to life, property and livelihood. By cultivating these medicinal plants, the farmers can help prevent erosion. 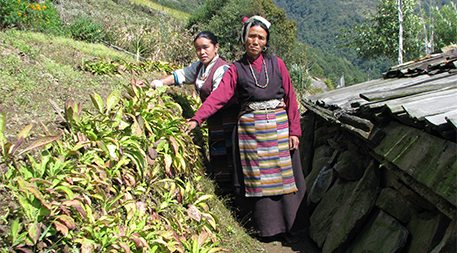 Chiraito grower Rinen Bhote (foreground) is helping support her family while protecting the integrity of forests and deforested lands in the Himalayan highlands. Photo by Karma Bhutia, The Mountain Institute.